Mood board: Our lives are folded into our phones. Wallets, iPods, address books, diaries – all of them on one device. And so, across fashion and into the streets, a new accessory is taking over – the small pochette, big enough for a phone and a portable charger, but nothing more. This minimalism of dress has nothing to do with minimalist fashion, but it chimes with the need for clean, rigorous lines. Unfussy clothes. 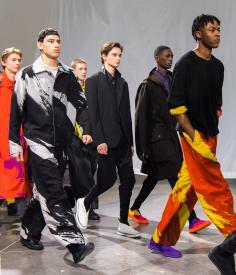 The kind of practical, energetic suiting and silhouettes that Yusuke Takahashi does at Miyake. Added to this are the artisanal techniques and rich technical fabrics developed in the studio in Japan. Takahasi isn’t a die-hard minimalist; his colours and patterns are rooted too heavily in the flora and fauna of life. A/ W 2019 explored an easier, free-er wardrobe. Free to move. Best in show: Takahashi said the collection, entitled ‘Feeling the Wind’, was his way of using the power of nature. Yet this wasn’t a blousy, dramatic affair. The clothes had a poetic severity. Sharp yellow batik dyed tumbling waves were on linen lyocell. In the quest for elegant wearability and warmth, the look was constrained and rigorous. A technical three button blazer had ruching at the back; fringed wool made into overcoats had been shrunk after double weaving, lending it a blustery texture. There was a lightness to the drape to contrast with the autumnal longing for warmth. Heavy knitwear had a springtime ease yet this was a trick of the eye - the clothes were all snug. Tailoring sat away from the body.